It's a unique model - the worker-owned business. Some say it sounds like socialism, but these six companies say it's helped them tough out the recession. Worker-owners from the We Can Do It! 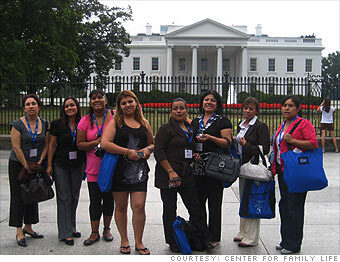 co-op went to Washington recently to participate in the Hispanic Caucus Public Policy conference. From left to right: Teresa Perez, Margarita Pavon, Inocente Ponce, Daniela Salazar, Alicia Chavez, Patricia Mora, Monica Valerio and Luz Maria Hernandez. In 2006, Latina immigrants in Brooklyn, N.Y. formed a housekeepers' co-op to avoid exploitation, according to Vanessa Bransburg, cooperative coordinator of the Center for Family Life. With the help of the community organization, 19 women from Mexico and the Dominican Republic formed We Can Do It!, or Si Se Puede!, a slogan used by organized workers in Latin American and California. "A lot of these people really had the entrepreneurial spirit, but a lot of them don't really have up to high school education, so they weren't able to get a traditional job," said Bransburg. "Instead of following somebody else's rules, they wanted to be the bosses." The Center acts as their agent, with 100% of the cleaning fees going to the workers, who pay $40 in monthly dues to cover marketing costs. The organization has spun off two other worker co-ops: Beyond Care, with 19 child care workers, and Émigré Gourmet, a cooking collective. All the worker-owners have equal control over marketing and they develop their own relationships with their clients, said Bransburg. "With all of this happening, they've been able to withstand the recession and even grow in the last few months," she said. NEXT: Full Sail Brewing Co.